The dramatic impact on the dollar of the Fed's statement is made clear by the 1-day chart for dollar proxy UUP shown below. 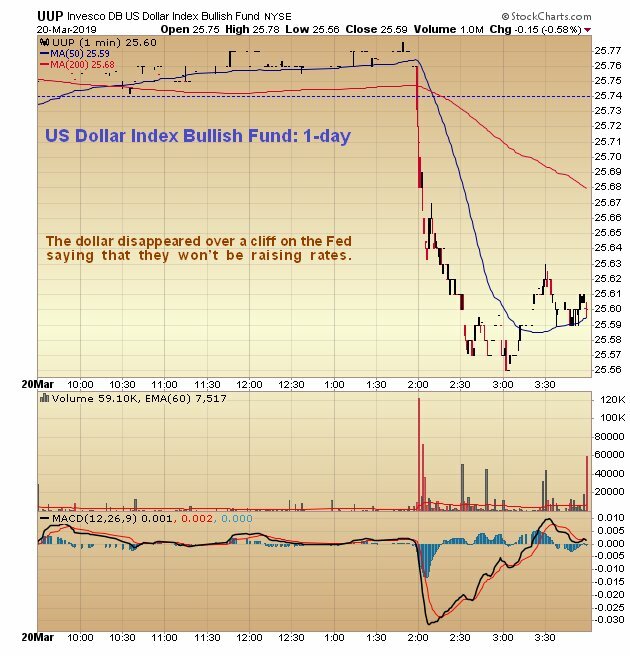 The Fed spoke at 2 pm, and almost immediately the dollar cratered. Action in gold proxy GLD, which had looked shakier earlier in the day, was positive, with it advancing to close near to its highs, and it looks like it is starting another upleg within the large parallel uptrend shown. Precious metal stocks were set up to tumble in the event that the Fed was hawkish on rates, with a potential Head-and-Shoulders top evident on the GDX chart, but the Fed's weak and accommodating stance ripped the rug out from under the dollar, which was, of course, great news for the precious metals sector, which is why GDX closed with a prominent bullish candle on its chart, after testing the support of its trendline earlier in the day. 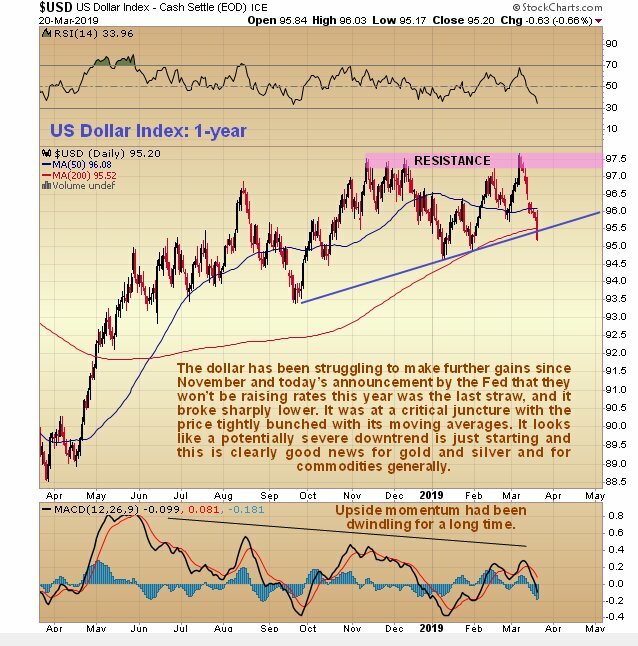 The conclusion is that the dollar looks set to tip into a serious decline, which means we should see a strong upleg in the precious metals sector and in commodities generally. 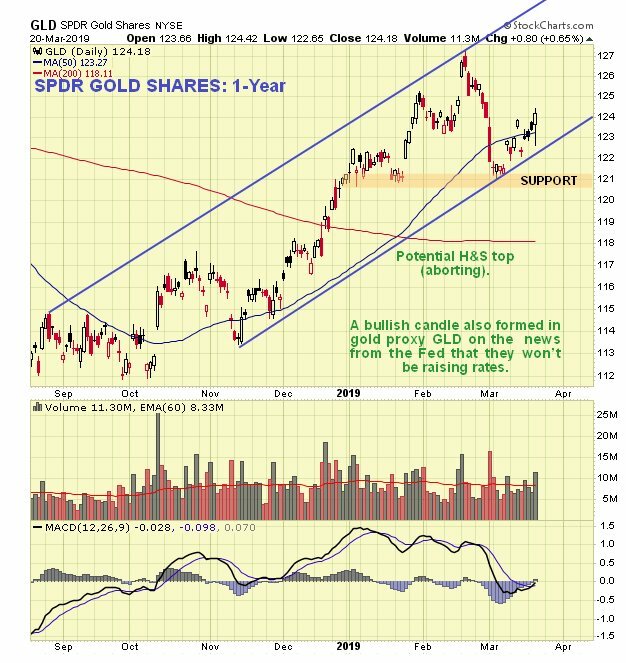 This will likely result in the long awaited gold breakout above $1,400. 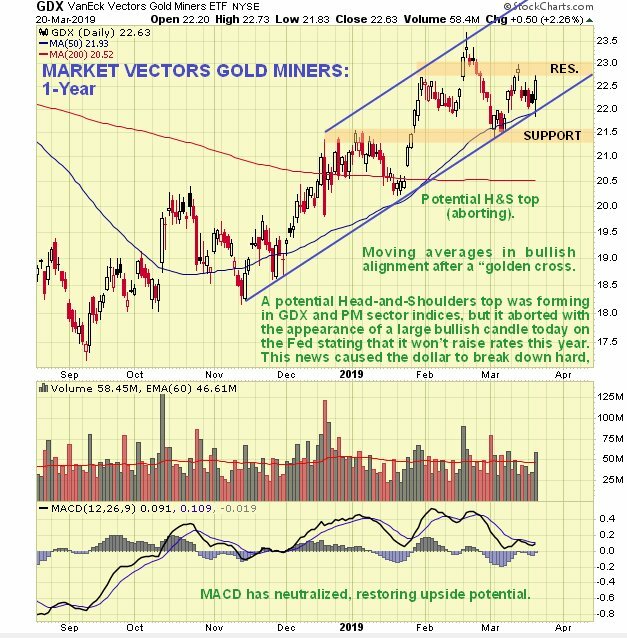 In closing I want to bring your attention to Vista Gold Corp. (VGZ:NYSE.MKT; VGZ:TSX), which has always been something of an "index slave," i.e., when the sector goes up it goes up. It is looking well placed to advance anew here having reacted back near to its rising 50-day moving average and unwound its earlier overbought condition.